I had an early indication that this was going to be a good trip. 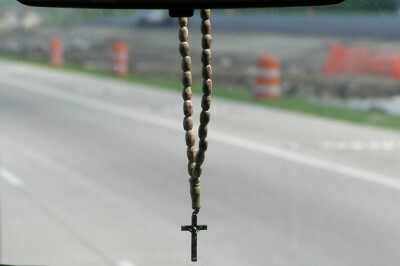 On the van ride from the airport to the hotel, I noticed that the driver had a set of prayer beads dangling from his rear view mirror. And not just any prayer beads! I had never seen any like these before. They appeared to me to be a hybrid of two forms – the beaded section was a Muslim subha, with 33 oval beads leading into a shaheed, an elongated bead. But where Islamic prayer beads will end with the shahed (the “witness” bead) or maybe a tassel, his had a crucifix added to the end of the shahed! How cool is that? I asked him about it as I was paying him and he said a friend had sent them to him from Jerusalem. He said he was a Christian and that he prayed the “Hail Mary” prayer of the Catholic rosary on his beads. COOL! I was outrageously nervous before speaking. I spent about 2 weeks working on my speech, which was to last about 20 minutes. Let me tell you, 20 minutes is a LOOOOOOONG TIIIIIIIME. I wanted to tell the 96 or so attendees about the connection between creativity and spirituality, my favorite subject. I wanted them to see that when they sit down to make a quilt – or perform any craft – that the time and energy they put into it is an act of devotion because the gifts that allow them to make art come from God. Once you realize that, it is only one small step to making all art and craft time into prayer time. 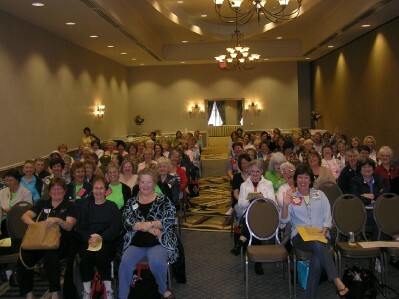 Here’s a picture of my audience I took from the podium. A nice looking group! The speech went well, largely because the women (it was all women) were so loving and giving with their attention. They made me – a non-quilter and frequent questioner of my faith – feel accepted. After a while, I lost my nervousness and settled in. It was a joy. After I spoke, I had some time to sell and sign books. 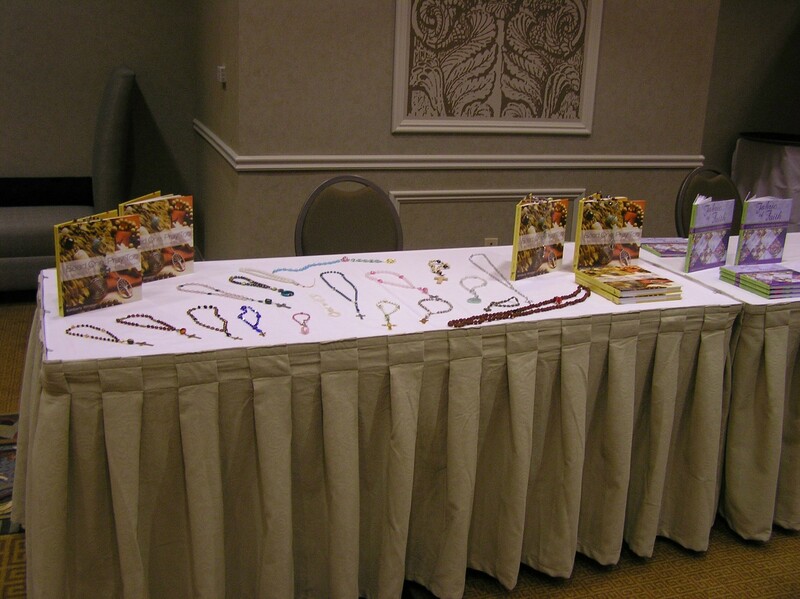 I set out both the Fabric of Faith book and new book, Bead One, Pray Too: A Guide to the Making and Using Prayer Beads. I decorated the table with all of the prayer beads I have made in thelast year or so – Anglican prayer beads, Catholic rosaries, Baha’i prayer beads, Hindu malas and Muslim subhas (I realized I do not have a Buddhist mala!!!!). It was wonderful to share them with people who understand both prayer and art, many who had never seen the Anglican and non-Christian forms before. I signed 20 prayer bead books and about 15 prayer quilt books. It was great. But even better were the comments of the people who had heard me speak. I cannot tell you how many women came up to the signing table and told me they, too, had at one time or another found it hard to pray. They, too, had been mad at God at different times, or had otherwise felt his presence diminish in their lives for one reason or another. But they all told me stories of great hope – that with patience, God eventually found them again (or they found Him). Kimberly, it is we who were blessed by your being there with us this weekend. It was such a joy to spend some time with you and hear you speak about that something that is obviously so precious to you. Thank you so much for sharing part of your story with us. I’m already trying to figure out a way to get you back here. ha ha! Dallas and Prayers & Squares loves you! Oh, Nikki! Thank you! And I am only sorry I didn’t get to say a proper goodbye. I went upstairs to pack my bag and when I came down EVERYONE WAS GONE! I didn’t even got to say goodbye to Kathy! I would love to come back to Dallas someday. I thought you were leaving early Sunday morning or I would have made sure to see you before you left. I’ve been talking about you to all my friends and I can’t wait for them to meet you someday. Soon, hopefully. I was talking to Jim (DH) about Shakira’s quote about working within your gift and he said, “That’s what you do.” What a blessing that he has noticed. My chapter members and I will strive each day to do just that. Kimberly, you touched me with your talk! Making me see I am using my God given talents & connecting creativity and spirituality to spread his love! I thank you for sharing with our group! Thank you for signing my books! I am reading Your Bead One, Pray Too book. Hope you will come to Iowa In 2010.